Maintaining a flexible approach can be difficult in biopharmaceutical research; core laboratories must balance the ability to adapt to individual project requirements with the need for efficient, high throughput processing of ever-increasing sample numbers. Novo Nordisk’s Research Bioanalysis Department has adopted a semi-automated workflow, which combines the versatility to work across the company’s various research areas with accurate and reproducible testing of thousands of samples a day. Originally established in the early 1920s to manufacture insulin for the Nordic market, Novo Nordisk has retained a strong focus on the treatment of diabetes. Today, this expertise in protein and peptide technologies is also being used to develop products for hemophilia and other bleeding disorders, as well as growth and hormone replacement therapies. Biopharmaceutical development and biomanufacturing rely on an in-depth understanding of the complex in vivo actions of therapeutic products to ensure their safety and efficacy. The Research Bioanalysis Department, based at Novo Nordisk’s research center in Måløv, Denmark, is responsible for investigating the pharmacokinetic and pharmacodynamic profi les of drug candidates from across the company’s research pipeline. Samples from animal or cell culture experiments are tested with a panel of 100 to 200 immunoassays to gain a thorough understanding of their activities. 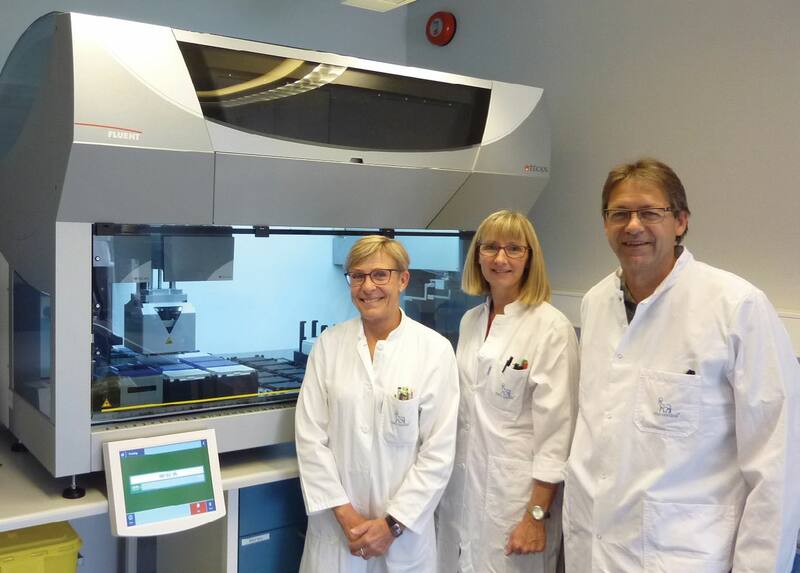 Around 15 years ago, the laboratory automated its ELISA procedures to increase throughput, and improve the accuracy and reproducibility of testing. "Staff like the Fluent platform – it is completely reliable, very fast, accurate and nice to work with." “Accurate and reproducible low volume dispensing is vital to achieve reliable assay performance using this very sensitive immunoassay technology, and we worked closely with the local Tecan team to design a site acceptance test that would demonstrate the suitability of the system for our needs. We were immediately able to achieve very low CVs of 2-3 % for 1 μl plasma transfers into dry 384-well assay plates, so we were confi dent that it would perform as expected. Another nice feature is the extended volume tip adaptor, allowing us to combine four channels of the Multiple Channel Arm to perform 96-well dispensing of up to 500 μl at a time. This makes it very versatile; you can perform 100-fold dilutions in a single step, something we have not seen on any other liquid handling system.” “Staff like the Fluent platform – it is completely reliable, very fast, accurate and nice to work with – and everyone in the department runs the same set of universal scripts, simply changing the dispense volumes, dilutions, matrices and buff ers between the various assay procedures. Everything we need is programmed into the user-friendly FluentControl™ interface, and I especially like the way the liquid classes are built up within the software. Our local Tecan application scientist helped me to do the initial scripting, so we were able to get the various protocols up and running as we wanted within two weeks of delivery,” Johannes concluded. All Tecan products mentioned are for research use only. Not for use in clinical diagnostics.